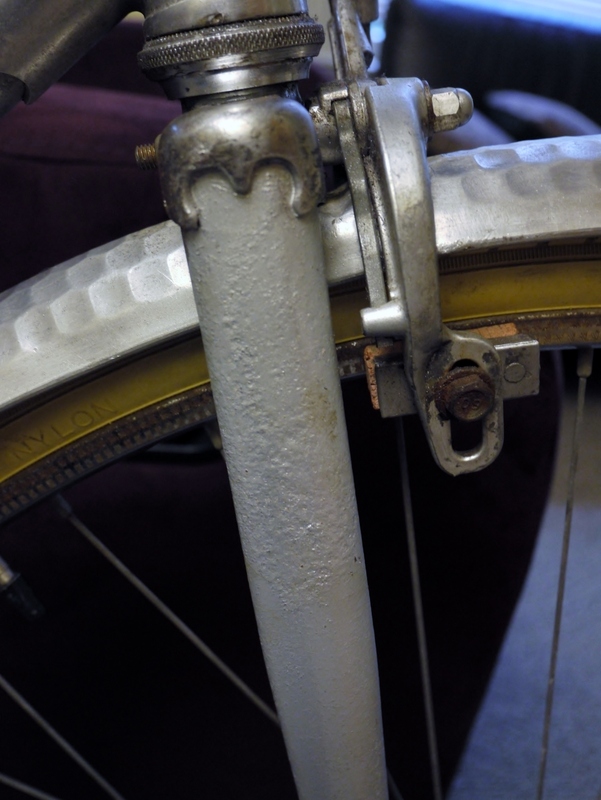 The 1940’s/50’s Meca Dural bicycle that I am currently restoring had an unfortunate encounter with an amateur spray painter. 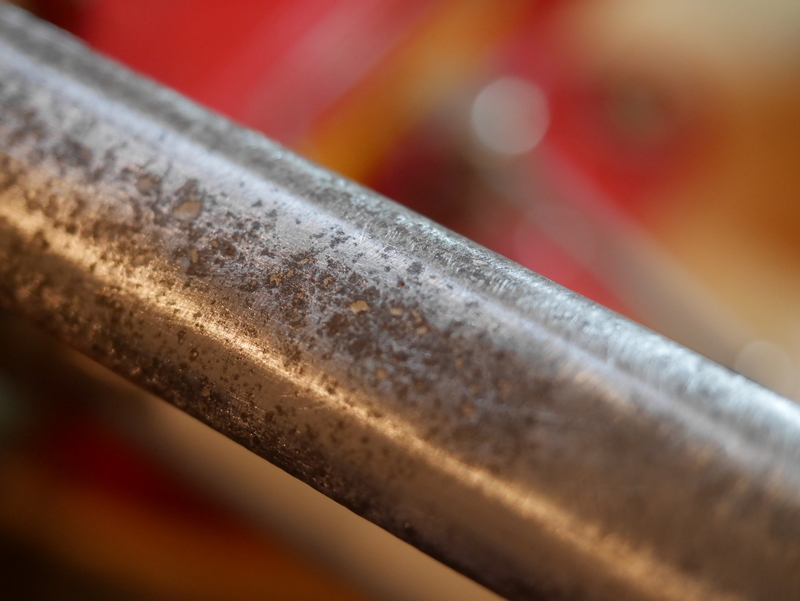 While this bike’s frame is made from duralumin, a form of aluminum alloy which needs no paint because it cannot rust, the bike’s fork was steel. When I purchased the bike, I knew it had a number of issues, the horrifically painted steel fork being one of them. As you can see from the photos, the spray paint appeared to be hiding rusting and pitting on the fork blades. 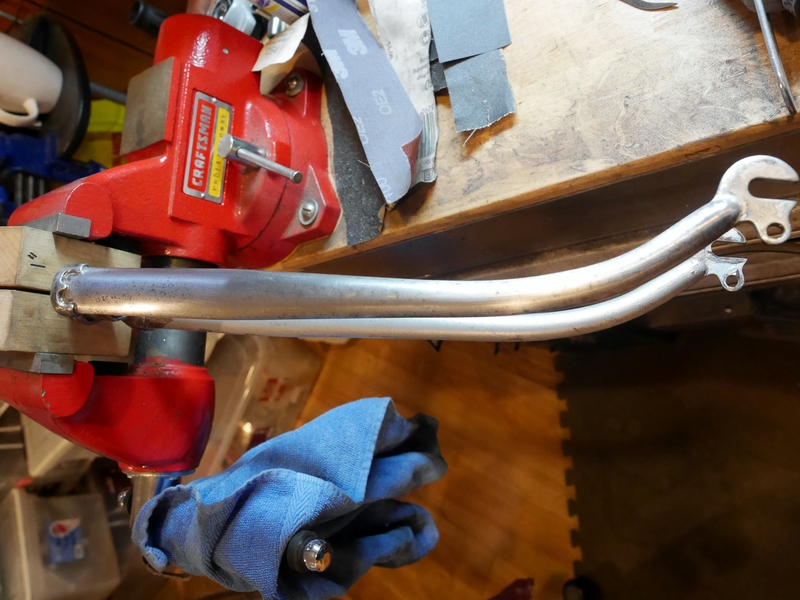 While I normally send all paint jobs out to the professionals, feeling that frame painters deserve their due, I decided that I wanted to prep this fork for painting myself so that I could assess the usability of the fork. Before venturing out into this unknown territory I did some research to determine what materials and tools I would need for the job. 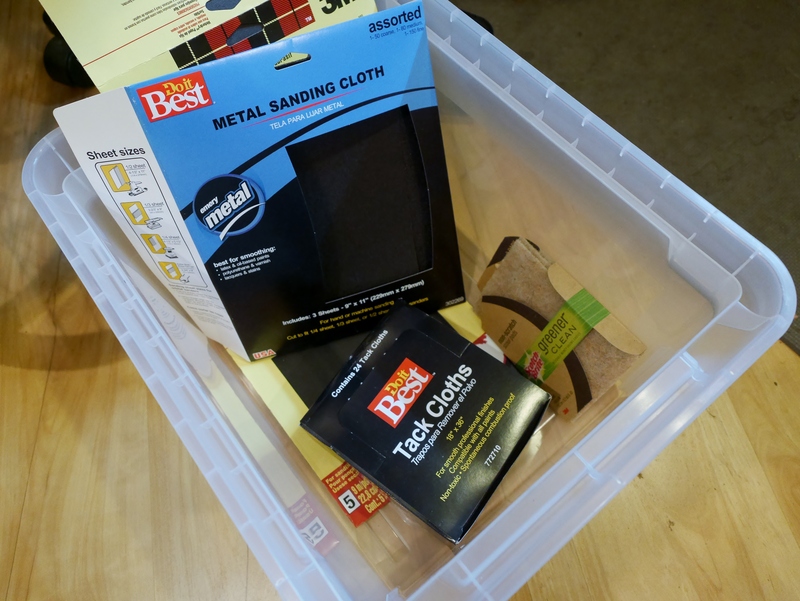 I ordered emery cloth and wet-dry sandpaper in varying grades, some brass brushes (which will not scratch steel), and a few other items such as tack clothes and dish scrubbers. All based on advice from Randy at mytenspeeds.com who has done some very nice paint work on his collection of bicycles. I knew that I did not want to use harsh, environmentally unfriendly chemicals for this job. 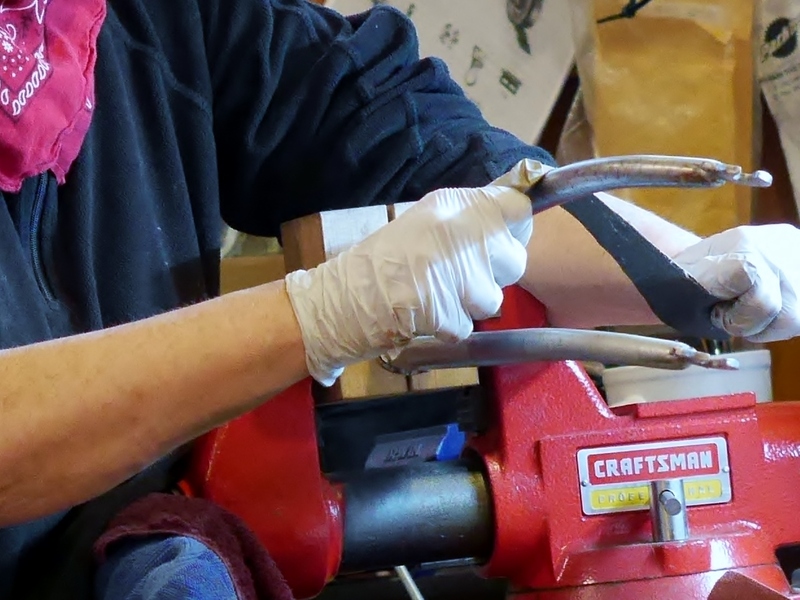 I fired up my new (non-wimpy) Dremel to use for the hard to access areas near the fork crown, but for the fork blades themselves I wanted to do all the work by hand, the old fashioned way. Unfortunately, whoever painted the fork did so while it was covered with rust. When I began to remove the paint, I was disappointed to see just how bad the fork blades looked. The blades are pitted near the fork crown. I wondered whether I should try to remove enough material to eliminate this pitting, worrying that I might take too much off and weaken the fork blades. 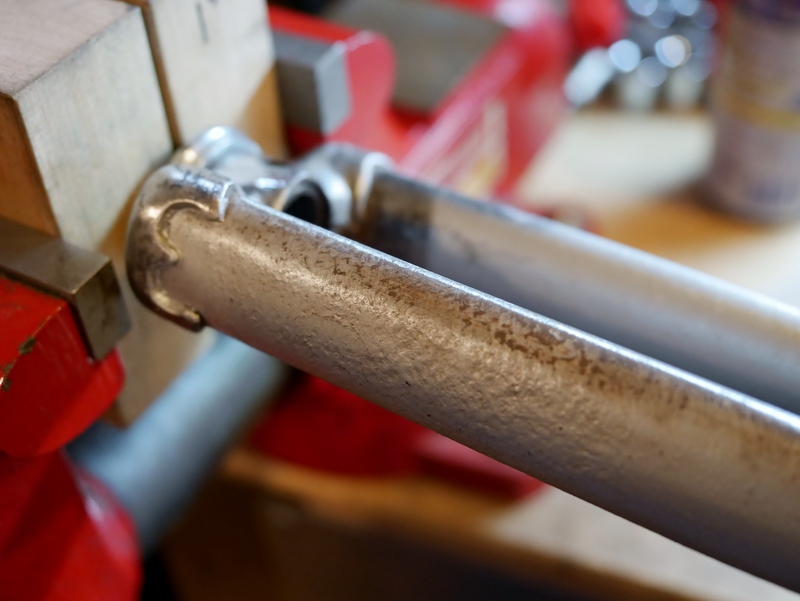 Then I remembered that fork blades are very thick and sturdy, given the job they must do, so I decided to keep going after observing the very nice brazing done on the dropouts and fork crown. The fork is well constructed, and deserved my efforts, I felt. 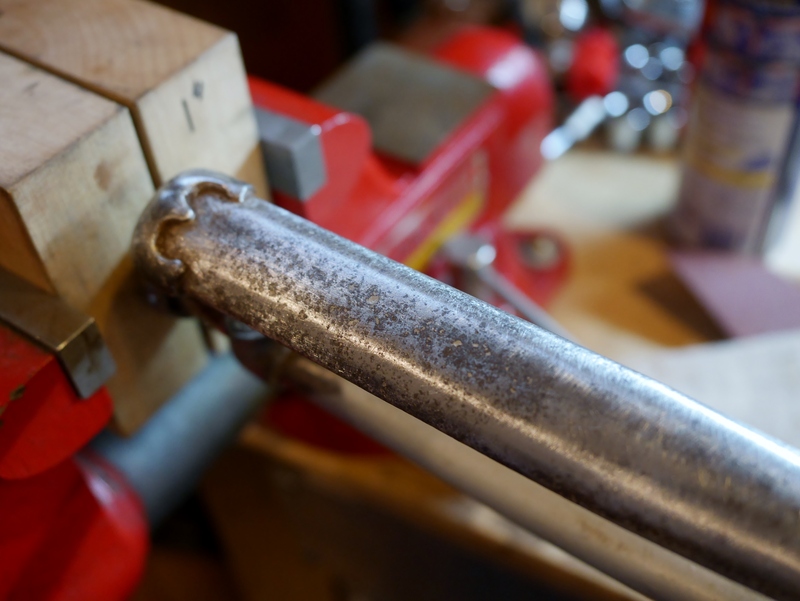 While I was working, I was reminded of the bicycle frame that I built, and the effort required to sand the frame and remove excess brazing material. This is a very similar process. 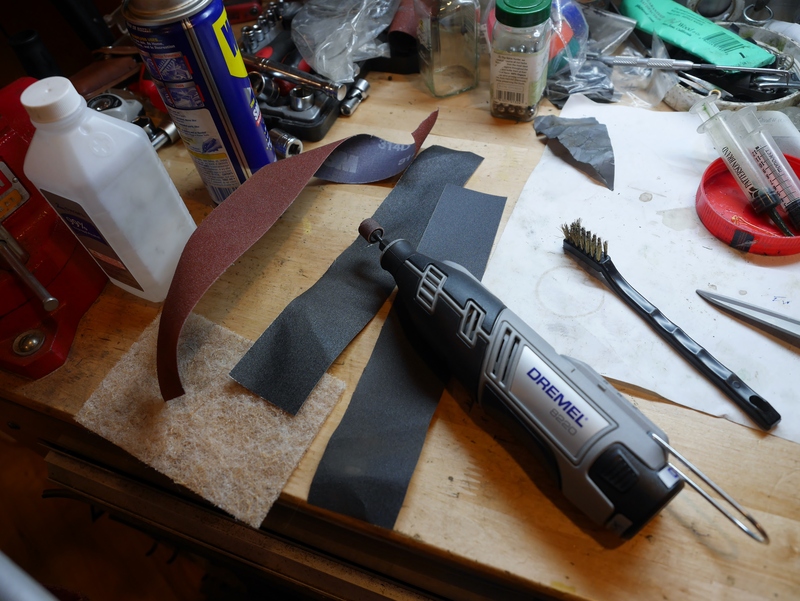 Using vigorous and speedy strokes with the emery cloth and sandpaper was the key to bringing the fork back to life. Wearing a mask is a good idea, since you will be creating a lot of dust in the process. You can see the progression in these photos. This process took about 4 hours, and yet I still need to continue sanding with finer grade sandpaper to complete the work and have the frame ready for paint. One thing to know: it is most efficient to sand very quickly, mimicking the action of a power tool. 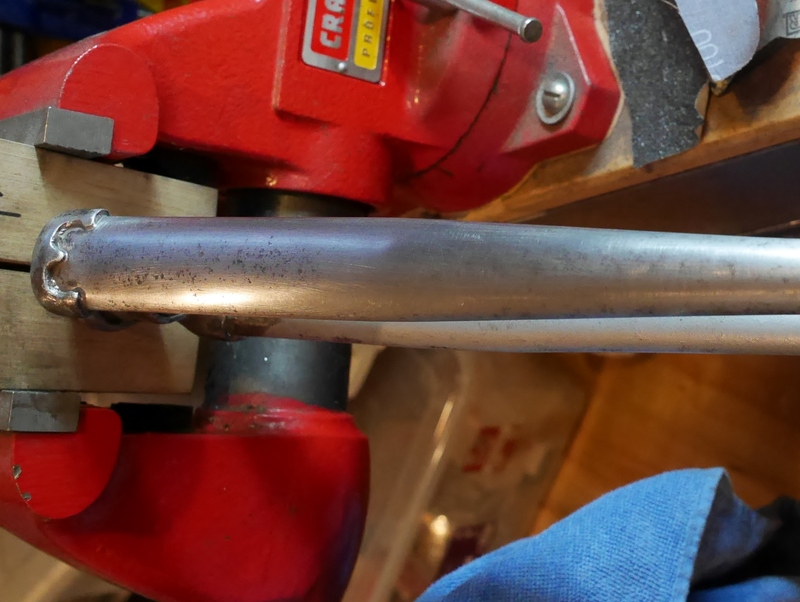 While my hands are now sore, I am happy with the results, and look forward to the finish work needed before I send this fork off to be painted. 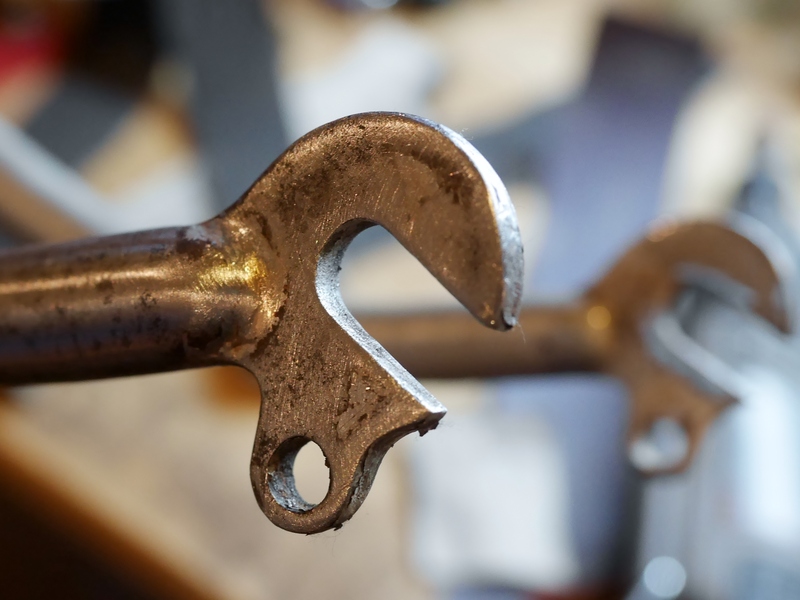 This entry was posted in Bicycle restoration, Meca Dural, Mercier, Vintage French Bicycle and tagged bicycle frame paint removal, duralumin, Meca Dural, steel fork by Nola Wilken. Bookmark the permalink. Thanks, Cecil! It does take Zen-like patience. I ended up with a blister on my thumb. Great work Nola! A labor of love, for sure. I cannot wait to see the results along with the final build! I am curious, did you consider having this fine machine gently bead blasted (soda blasting, etc.) to have the paint removed? Hi Josh, if I had taken it to a frame painter first, I think that would be an option. Josh is referring to Soda Blasting, which is similar to sand blasting, only a bit better because baking soda is used, which is water soluble and has its own cleaning properties, as well as being much more environmentally friendly. 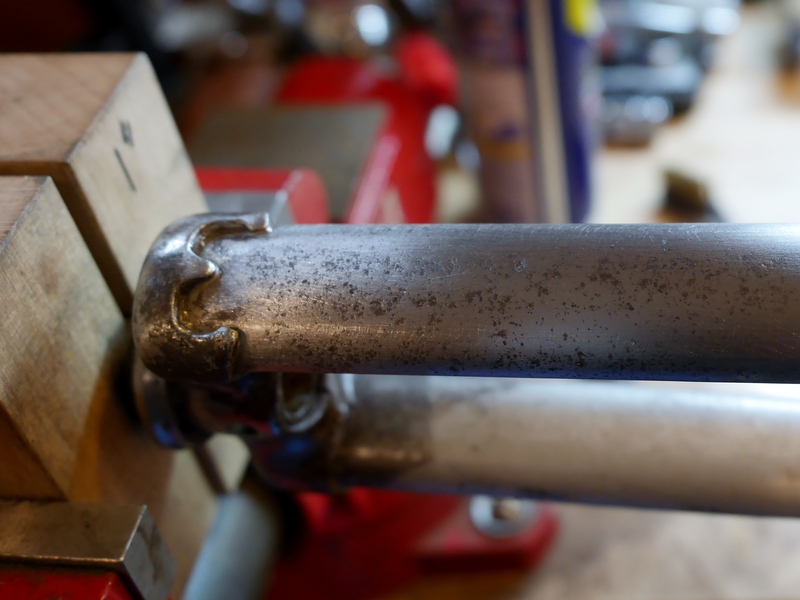 In fact, the fork may still need to be soda blasted, depending on how well I do at removing the paint, rust, and pitting! I haven’t had any experience with this process, so will report on it if that is the way I go with this fork. 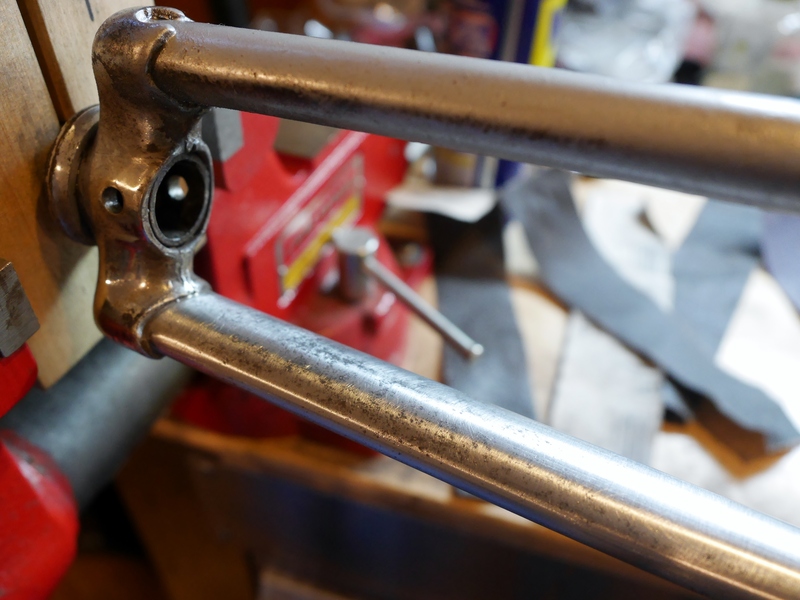 After researching other Meca Dural frames, I see that typically the steel fork was fully chromed to complement the bare aluminum frame so that is what I am planning to have done. That will be fantastic! Wonderful addition and, of course, I can appreciate your delicate approaches to ensure a proper and thorough restoration.